and... He's standing right behind me, isn't he?" It's not exactly a fun time to be an NHL general manager these days. In a growing number of cities around the league, some of the game's most respected executives are facing harsh criticism, intense pressure to improve their rosters, and even outright calls for their dismissal. 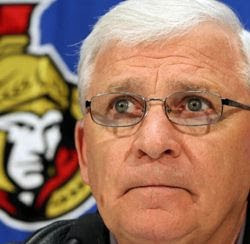 Bryan Murray is watching his team implode before his eyes. Brian Burke is under constant fire in Toronto. Jay Feaster has been handed a mess to clean up in Calgary. And even previously untouchable veterans like Darcy Regier and Lou Lamoriello are seeing their reputations tarnished thanks to underperforming teams. What's a struggling general manager to do? Well, a few things, actually. And since surveys tell me that a majority of my readership consists of current NHL front office executives, I thought I'd help them out by putting together some tips to guide struggling GMs through difficult times. DO: Attempt to quickly improve your roster by phoning any colleagues who you think might be willing to part with star players cheaply. DO NOT: Angrily call your service provider demanding to know why Darryl Sutter doesn't seem to be returning any of your voicemails. DO: Arrange to deliver a motivational speech to the team before their next game. DO NOT: Pause before you begin speaking, look slowly around the room, and then ask the head coach "What happened, did all the good players call in sick today?" DO: Seek to create more cap room by making creative use of waivers, minor league assignments, and buyouts. DO NOT: Seek to create more cap room by putting rocks in a sleeping Ilya Kovalchuk's pockets and rolling him into the Passaic River. DO: Reassure the team's owner that you have everything under control. DO NOT: Try to end the conversation prematurely by making static noises and saying "this reception is terrible, I can barely hear you", especially since he's sitting across from you in your office. DO: Be sure to remind every reporter you speak to that you don't intend to make a trade just for the sake of making a trade. Several times a day, if possible. Until the end of time. DO: Ask your assistant GM whether he has any ideas for improving the team in the short term. DO NOT: Ask your assistant GM why he keeps pulling out a tape measure and taking measurements around your office as you're talking to him. DO: Hang up the phone immediately if Bryan Murray calls to ask if you'd be interested in trading for Sergei Gonchar. DO NOT: Forget to set your phone on fire and beat it with a baseball bat immediately afterwards, just in case. DO NOT: Callously throw your underachieving franchise player under the bus. DO: Show the proper respect for your underachieving franchise player's many years of loyal service to the team by, instead, gently and lovingly placing him under the bus. DO: Pop your head into the owner's office and say "Hey, you're doing a TV interview with Pierre McGuire right now? That's a great way to get a positive message out to our fans!" DO NOT: Put too much thought into why McGuire responds "Uh, yeah, TV interview…" while awkwardly sliding his resume under a file folder. DO: Answer any questions about your coach's job security by emphatically telling reporters "I want to be absolutely clear, we are not so much as even considering a coaching change at this particular moment". DO NOT: Follow that by pausing briefly, looking at your watch, and then saying "OK, this particular moment is over now, right?" Also, I loved the mention of Pierre McGuire handing in his own resume! DO: In heartfelt interview with local press explaining your limited options for improving the team, refer to waiver wire as slim pickings and describe team's belt-tightening measures during these lean times. DO NOT: Giggle uncontrollably when announcing the signing of Kyle Wellwood the very next day to bolster the offense. I haven't even gotten past the picture caption and I've already laughed out loud. The Pierre McGuire one had me howling. Great stuff, DGB. Do: ask your coach to motivate his player's with an inspirational speech. McGuire has a chance in hell of getting a job in the NHL after what he pulled when he got fired in Hartford. Given that the Whale GM he screwed was Jim Rutherford I'm betting his name is still mud with many in the league. Actually Paul Holmgren was the GM at the time. 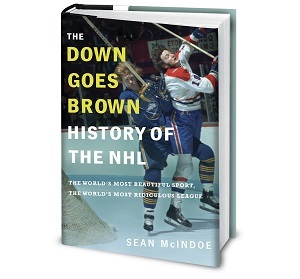 That year was a mess for the Whalers with PMG coaching, Holmgren in rehab for alcohol and the Buffalo bar incident. But if PMG screwed Homer over, then his name is probably still mud.